We took it easy and got up around 8:30 as we decided together the night before, one of the great benefits of a private boat charter is the fact of not having to follow a strict schedule, it can be tailor made to suit the personal needs and preferences. There's nothing better then having the chance to wake up in a tropical paradise, which in this case was Similan Island #4 where we were moored during the night, and have right away a nice refreshing dip in the turquoise sea. After a generous and delicious breakfast prepared by our cook and a few minutes of relaxation we set up our diving equipment. Once ready we gathered for a quick but detailed dive briefing from Jason and around 10:00 the captain finally dropped us at the entry point of of the first dive of this fantastic cruise, on Island #7. As usual Similan Islands offer the best conditions with good visibility and lots of fish, Stefano and Giovanni are very experienced divers so we easily managed to do a very nice 60 minutes dive without having to worry about air consumption. After we got back on board, dried out and exchanged the typical comments about the exciting dive, we climbed to the upper deck and quickly after that we saw the caring cool Ms. Rat coming up the ladder with a tray full of ham & cheese sandwiches as previously requested by Stefano and Giovanni who prefer to eat light things for lunch, as anyway on Sai Mai there are always plenty of fruit and snacks available so it's impossible to get hungry. In early afternoon we decided to move and more in the northern bay of the Island #8 also known as “Donald Duck Bay” due to a granitic boulder which shape really reminds the head profile of a duck . This part of the island is nothing short of spectacular, the beach is white, the water is turquoise and everything is surrounded by majestic boulders of granite rock formations scattered and arranged in a very particular way and mixed with the lush vegetation of the island. It's like if a giant hand put them there for some reason, and all this makes an amazing play of colors. After we rested for a while in the shades to let the hottest time of the day to pass we decided to set foot on the island to have a look around, wo with camera and sunglasses at hand we jumped on the dinghy boat always available as support on Sai Mai and the seaman accompanied me and Giovanni to the beach, while Stefano preferred to stay on board to chill out and enjoy the views. Island #8 is equipped with some Bungalows, tents and other facilities provided by the National Park to receive the numerous visitors of the day trips departing from Khao Lak. They also built a trail that allows to reach the top of the highest pile of granitic boulders, from which you get a breath taking view over the bay. The trail itself is very interesting because sneaks through the narrow passages and tunnels between the boulders. After an hour spent taking awesome pictures and getting our skin cooked under the heat we decided to return on board because here in Thailand sun sets quite early around 18:30 and we planned to do one more dive before it got dark. As soon as we rejoined with Jason, Stefano and the crew we untied the mooring and moved towards the nearby Similan Island #9 which also delimits the northern end of the archipelago. Short briefing, all ready and jump for the second dive of the day, this time on the site called “Breakfast Bend” on the north-east corner of the island. Also this one has been a pleasant dive, the site is characterized by a slope that starts from the surface and meets the flat and sandy bottom at a depth of about 20-25 meters, on the slopy part there are many coral pinnacles creating the perfect environment for the typical varieties of tropical reef fish. Later in the dive, while we were at a depth of 20 meters on the sandy bottom, our attention was seized by a strange and heavy rectangular shaped object partially buried in the sand, on which grew a thin layer of coral. Shape, size and texture made us one think of a small metal hermetically sealed box. Unfortunately the air in our tanks began to run low and we were now close to the no-decompression limit so we had to abandon our short "archaeological" experience and ascend to make the safety before surfacing. The fanciful hypotheses on the possible identity and contents of the "mystery box" have been funny subject of discussion almost for the entire cruise. After admiring the typical breathtaking sunset that the sea always gives at the end of a sunny day, we sat at the table to taste a delicious Thai dinner. Quality of food on Sai Mai can match the best Thai restaurants in Phuket. Don't necessarily need to do a long cruise to experience this. it's easy to try the daily Sunset Cruise and Dinner on MV Sai Mai. I joined this cruise because even though I did several tours and dives in the Southern Andaman Sea I never managed to properly visit Similan Islands and the few others north of them. 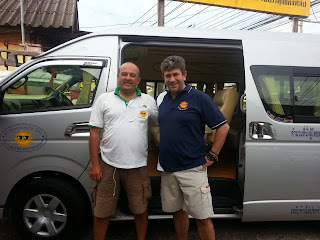 As confirmed the driver came to pick me up at my house on time in early afternoon and then we moved towards Phuket Airport to pick up Stefano and Giovanni who were scheduled to land soon, ready to go directly on board upon arrival. With us was also Jason, a nice guy, diving instructor like me but with several years of experience diving in Similan area. He was an addition to me in order to make the most of this beautiful archipelago and to give the best experience to our guests. After few minutes of wait finally Stefano and Giovanni, the guys (father and son) who chartered the boat showed up with their luggage. After a handshake and some conversation I quickly realized that we would get along nicely, something not always granted when you spend several days in confined spaces of a boat. Since we had to wait a few hours before the boat was ready as it just came back from a previous cruise, we decided to take some time stopping on the way to Khao Lak at a place called Cafe 360° View Point which offers a very nice view on the northern side of Phuket Island and later we had dinner and a couple of beers on Khao Lak beach. Between beers and chatting it quickly came the time to finally get on board and set sail. I always loved cruising at night time, with the lights of the fishing boats weakly breaking the darkness beyond the horizon, between the absolute silence of the flat sea and the gentle breeze my mind clears and starts flying. I could abandon myself to this peace for hours but in this case was better to be considerate and go down to the cabin to get some sleep in order to be well rested for the dives coming next morning. A great for surfing at Kata Beach specially when is high tide, during this week also the biggest full moon of the year, is making waves perfects. The high tide is at the moment around Noon but will move day by day to the afternoon, by end of the months tide will be less high as we will be in half moon. With this Moon we also saw change in weather conditions and now wind is very weak and sky is clear, the sea will calm down taking us into July that normally for Phuket is a very good month with conditions close to those in the winter, with little rain and flat sea. Great for diving with clear water, less divers and can enjoy special offers from hotels, two years ago in July we have spotted often Whale Sharks between Phuket and Phi Phi island. Today we close first month, actually two weeks, of our reports so for future reference everyone can see how was weather in Phuket in May. The month also closed with another great sunny day, no waves, almost flat sea and a mild wind that make perfect stay on the beach and relax. This is a great reward for those that don't listen to forecast and misunderstand what Monsoon means. We have welcome our loyal customer Angelo back again to Phuket to enjoy holidays and few dives. 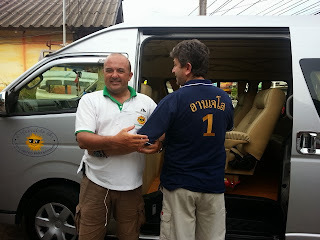 Can see from his polo that he has been Easy Day Thailand first ever customer back in 2009, coming back to Phuket almost every year, actually twice in last eight months. At Relax Bay in front Le Meridien Beach Resort in Phuket, people enjoy playing in the calm water and relax on the sun chairs. Really a beautiful day and was as this all day long. 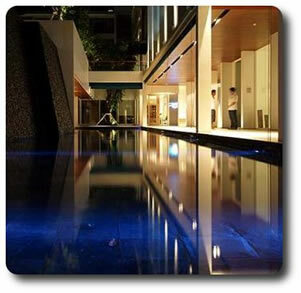 Taking your diving lesson and get certified in Phuket will also mean access to best training facilities, just see how big is the pool! Very nice and sunny morning. 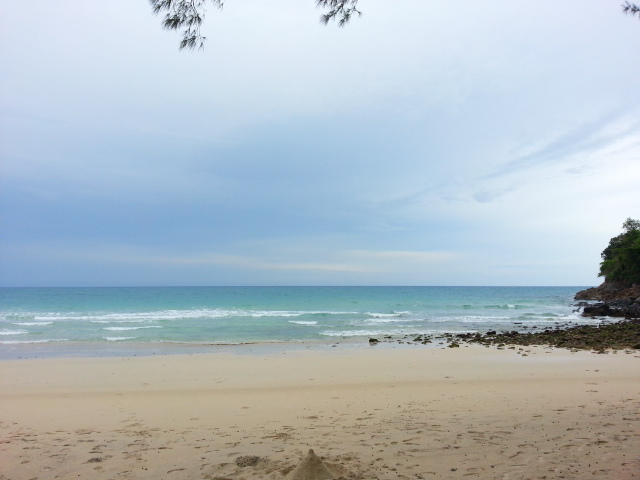 The air is so clear that from Chalong pier can see Racha Yia and Racha noi islands. they are are south of Phuket. Boats were ready to take people to enjoy diving, snorkelling and relax. Diving in Phuket is good all year round, with best visibility from April till October. Chalong Pier is locate in Chalong Bay, South East side of the island. All diving boats, most of speed boats and yacht are moored here as the bay offer shelter all year round. To get there from Phuket town take the Chaofa West road and drive down until pass Chalong Police station and at the circle take the road on the left. 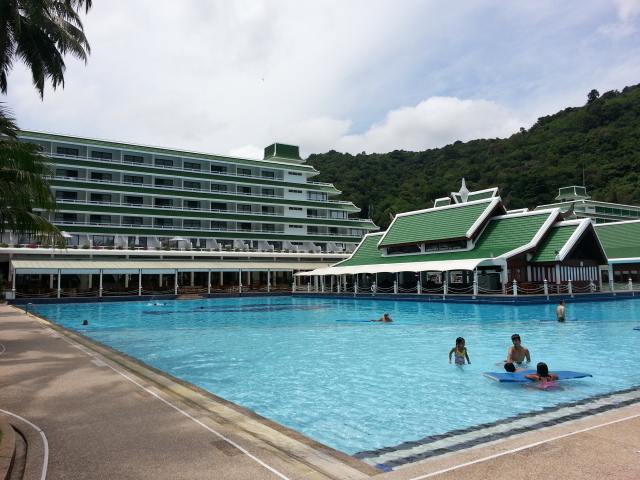 From Patong or any other location north, go south to Karon then follow from there. From Karon and Kata take the Patak road direction east, follow the sign to Chalong Bay, the road goes up the hill and soon you will see the bay. At the circle need to take the road in front of you. Form Rawai and Nai Harn, take the Chaofa West road direction North at the circle take the road on your right. The jetty is about 2km long and easily minivans can drop off and pick up customers. The weather as been good then for all day with wind blowing stronger drying the air and clouds formation. Sandra and her family had a great time on board our MV Sai Mai. Below Review comment was posted on Trip Advisor in May 2013. 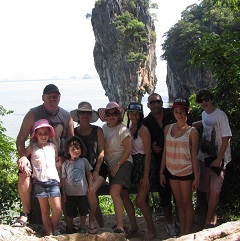 "Our family took a 3-day, 2-night trip on the Sai Mai in April, and it was wonderful. We booked the boat because it is small, as my husband and I wanted to hit the great dive sites, but also allow our three kids (ages 5, 7 and 8) to snorkel and enjoy the ride. The boat was great, plenty roomy and comfortable accommodations. Food was wonderful and help was always available anytime you needed anything. When we booked the trip, we hoped that we would be the only ones aboard, and indeed the owner told us the night before that we would be. However, to be safe, we had asked that he warn any other divers who booked that there would be kids aboard. After all, we understand that someone looking for a dive/party trip may not want to be bothered by children. In the end, we travelled with two lovely women from Germany, and learned that they had not been warned about the kids. Luckily, they were wonderful, and said they did not mind the kids being around an all. I hope they were telling the truth! But they were wonderful people and great dive partners. Speaking of the diving, it was very good. Squid, octopus, ghost pipe fish, sharks, beautiful coral, it was all here. Andreas, the dive master, was very knowledgeable and adept at finding the little creatures that you wouldn't want to miss. He also handled the gear so well, getting everything ready appeared effortless. Great prep talks for the dive, even resorting to his own home made maps, when pre-made ones were not available. He was also fun to talk to topside. A second guide, Jason, joined along to take the kids snorkelling while we were diving. He was endlessly patient, and the children had a wonderful time. My husband and I also did, as we knew they were well taken care of while we were diving. I'm sure this is not Jason's usual job, as he works dive boats and I'm sure is usually leading dives. But he was great. 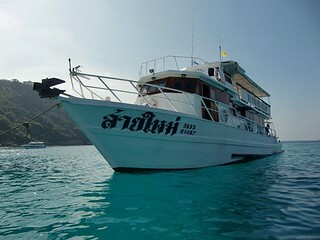 Simply put, we would love to dive from the MV Sai Mai again when we visit Thailand. We would definitely request the same crew and staff. Highly recommend this outfit to anyone"
7 night in Day Dream Deluxe double/twin sharing room at The Nap Patong. Round trip hotel transfer on all tours. All activities mentioned in the tour itineraries. Water/soft drinks, fruit and lunch on all tours. English speaking guide on all tours. Entry fees and National Park fees on all tours. 3 diving days at choice with Sea Fun Divers. Water and soft drinks free flow on board, fruit, snacks and lunch on board, tea and coffee. Tanks and weights, divemaster/instructor (max. 4:1 ratio), Nitrox 32% for certified divers.